Prepping for breakfast halfway through the season. 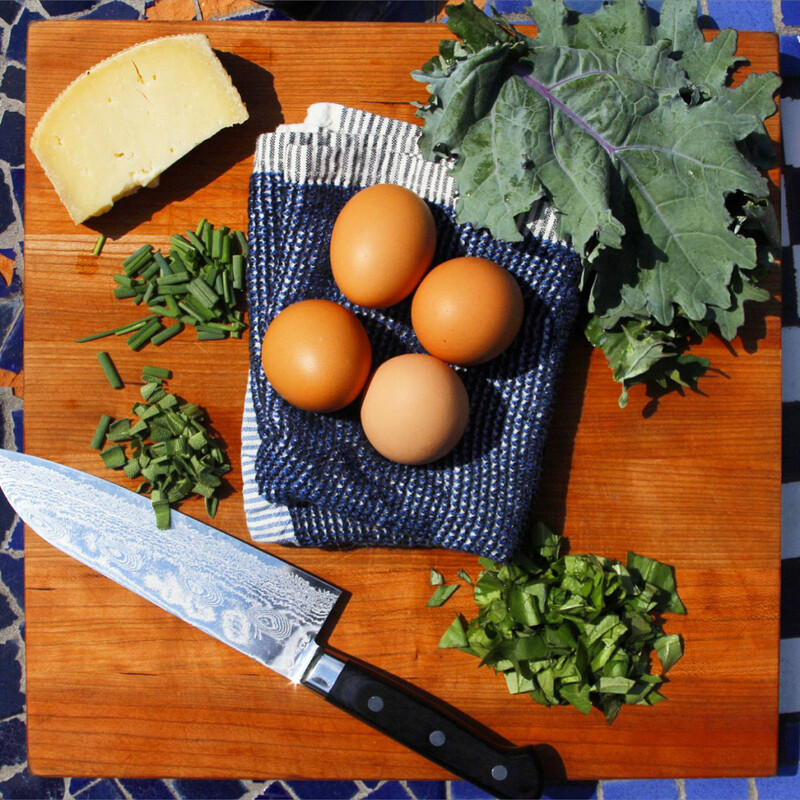 A few ingredients from our garden and the local farmer’s market graced the table this Saturday in July. Chives, basil and kale. Earlier in the season. By the end of April, there were enough chives to start throwing them into our weekend omelettes. 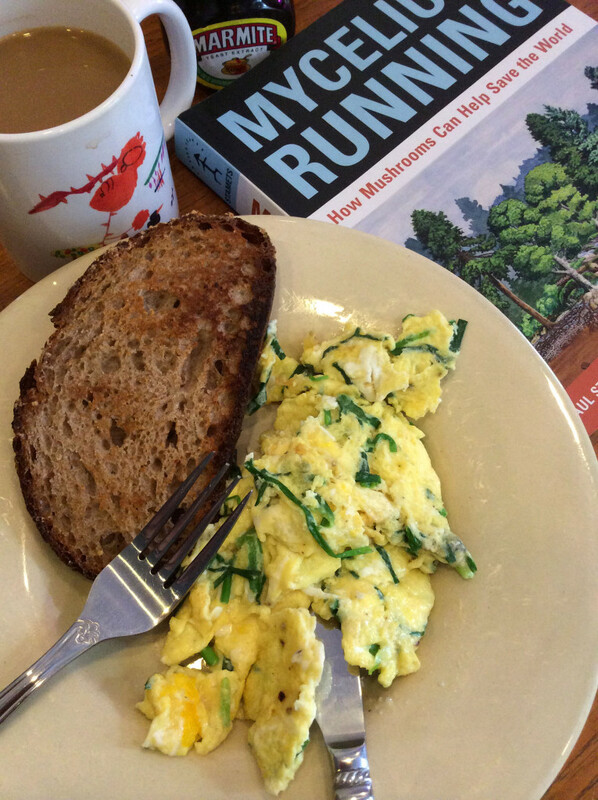 Paul Stamets’ Mycelium Running was rounding out my reading material. I was boning up on various mushroom production methods for the gardener and home grower. 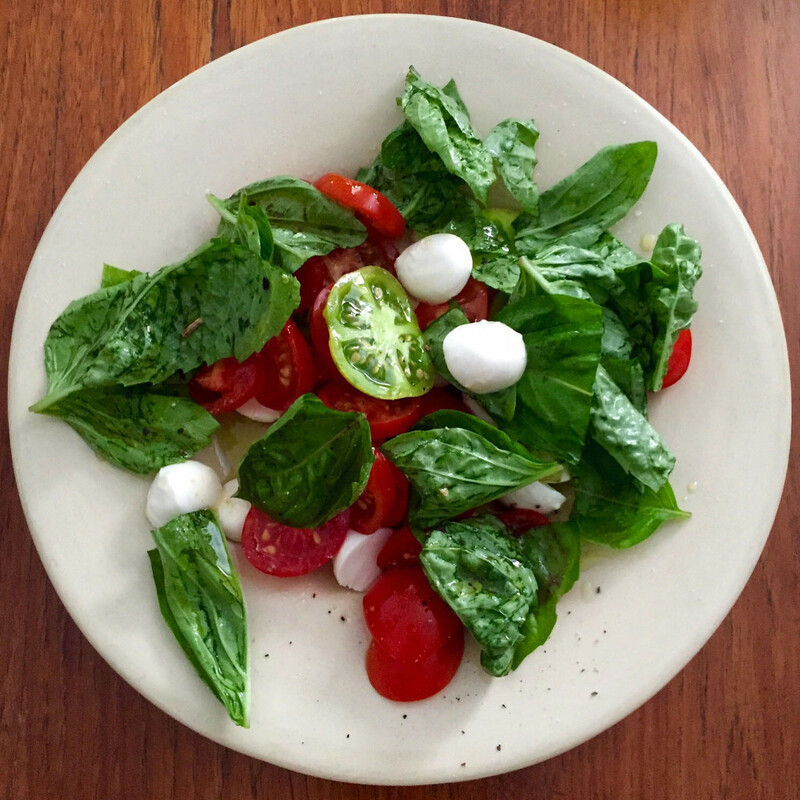 Hard to beat a Caprese salad in the summertime, this one with fresh basil, Fox Cherry, and Green Zebra tomatoes. 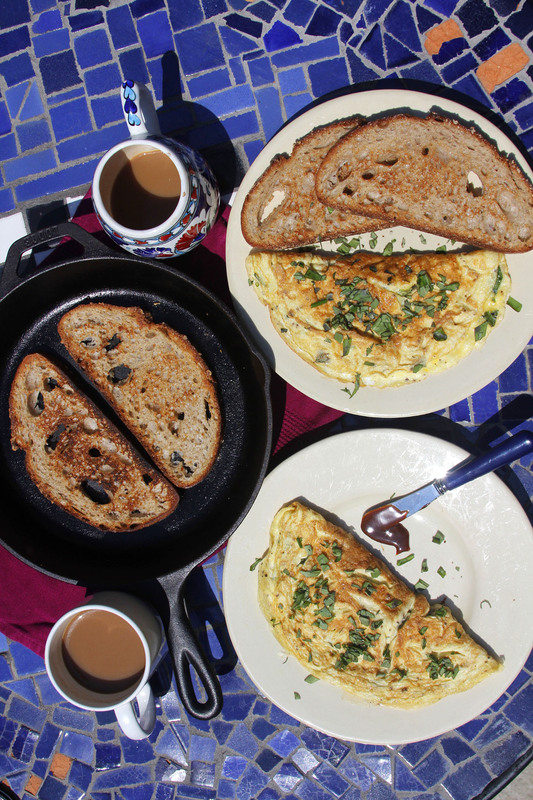 Yeah, more omelettes, this time al fresco. 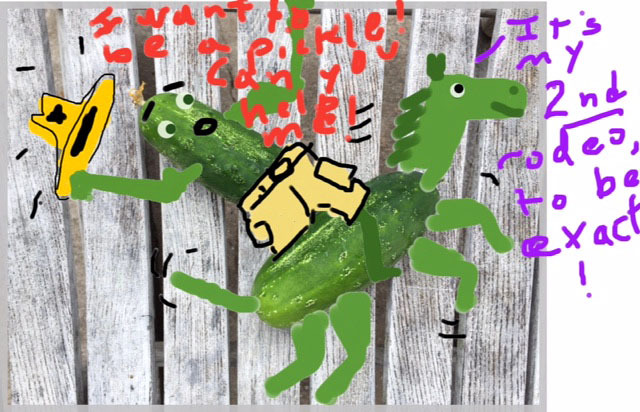 My lo-fi invite to Picklepalooza 2015. This is our mascot. Call him… Pete? Picklepalooza. 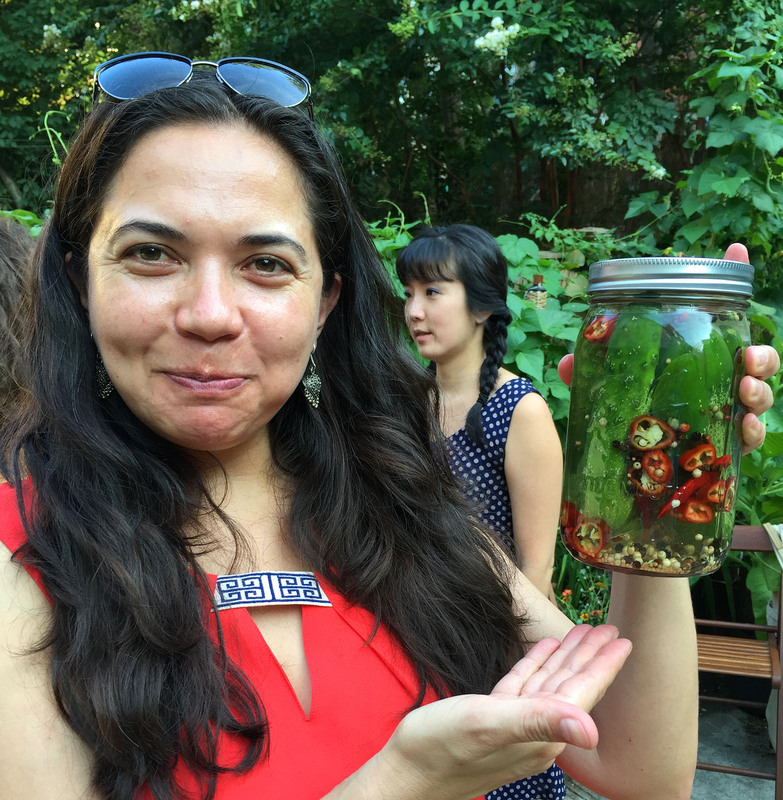 Our second annual pickling party, where friends come by the garden to pick fresh cucumbers off of our vines and throw them right into their own mix of brine, herbs and spices, which become fridge pickles, ready to eat in a few days. 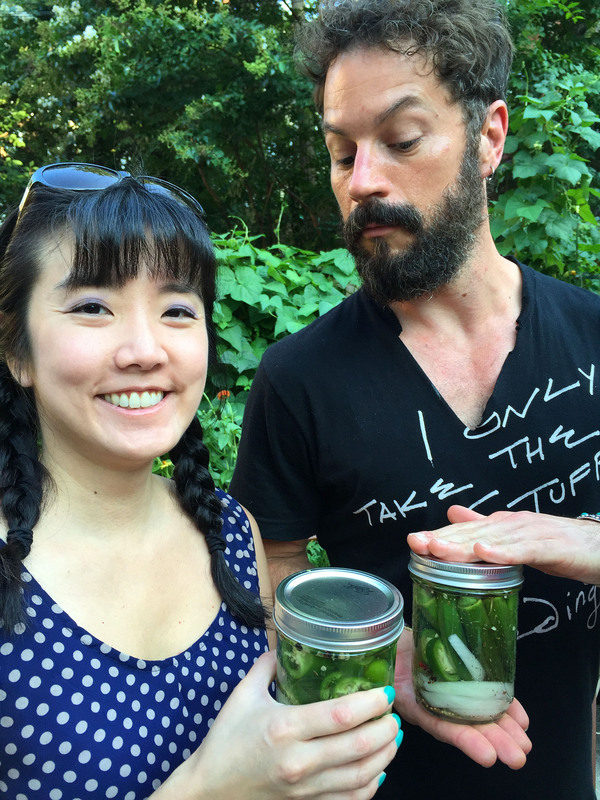 Everyone leaves with a pickle jar! One of these jars looks like it’s gonna have a little kick to it. A week or two later in the high cucumber season, I wanted to try something new with them. 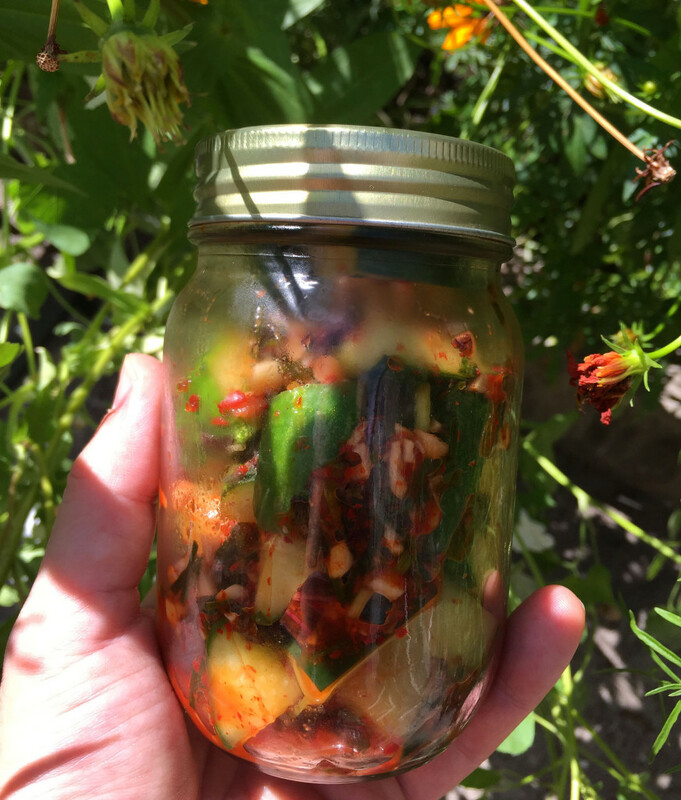 So I looked up a few guidelines to quick cucumber kimchee. Zach over at Riverpark farm had given me a few leaves of Shiso he couldn’t use, so I bought some of the chili flakes specific to kimchee from a Korean grocery store in the city and mixed up a quick batch—my first homemade kimchee. I let it sit for a few minutes before diving in. Really good! The rest of it, I let ferment in the fridge for a few days. I highly recommend it as an alternative for when the day comes that you just can’t eat one more pickle. 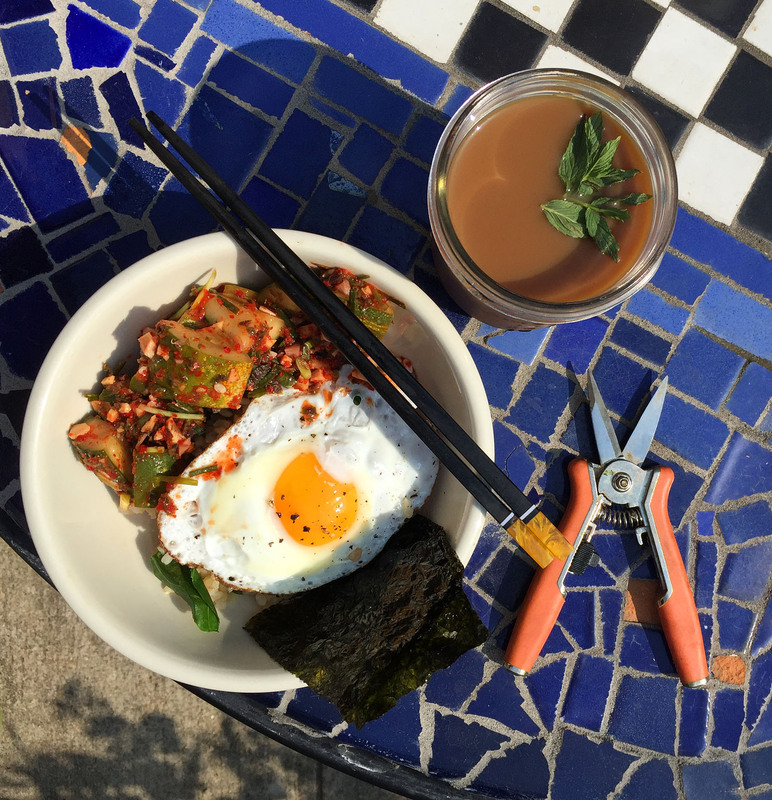 For a couple of lunches that week, I served it up with cold-brewed coffee, brown rice, a bit of Korean flaky seaweed, and a fried egg. My lady made a lovely succotash a couple of times over the season. 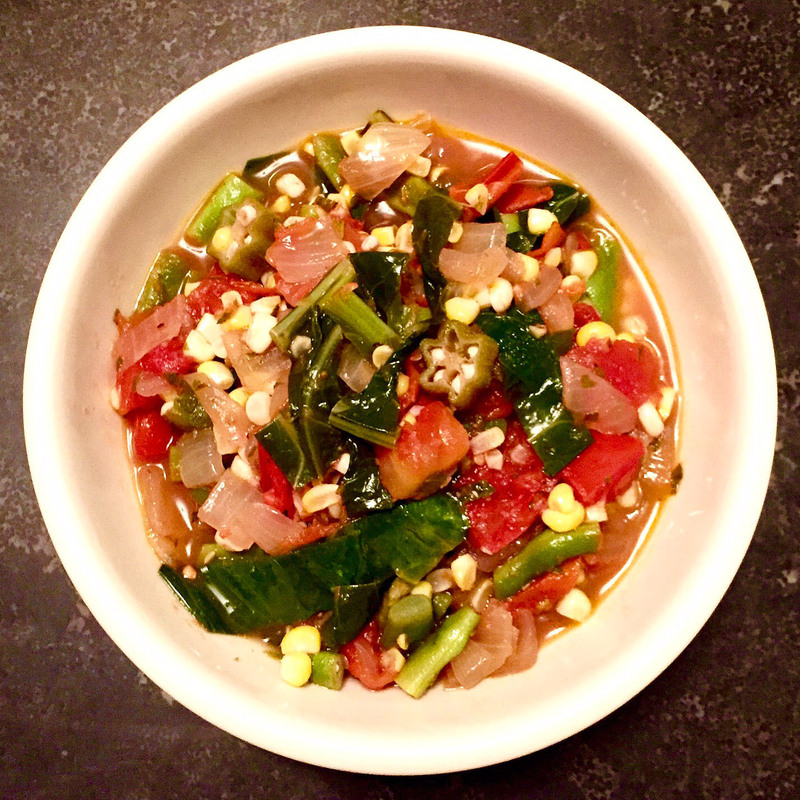 From the garden we have beans, okra, kale or collards, and tomatoes… maybe corn if the timing was right. From the farmer’s market we added a little onion. Next year: 100% garden ingredients is our goal! 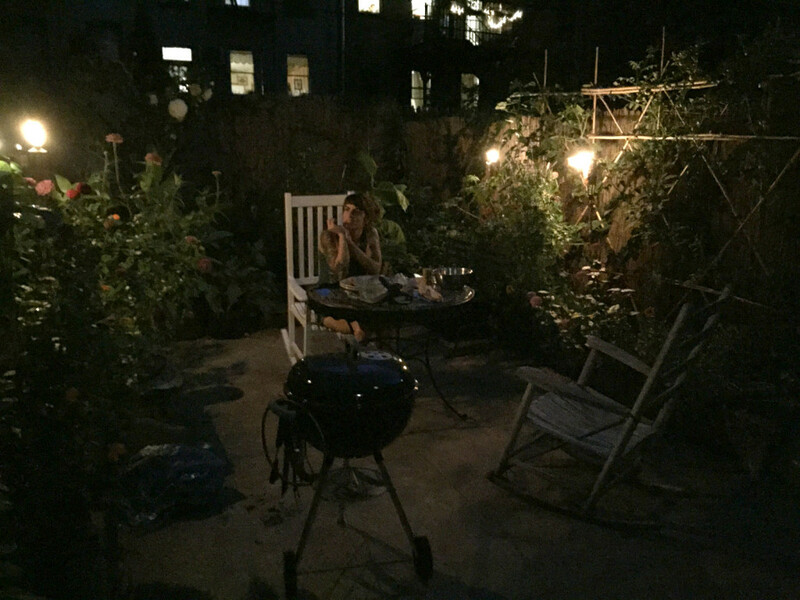 Plenty of BBQs to go round this year, but we like to have a few tiki-lit dinners to ourselves out there as well. 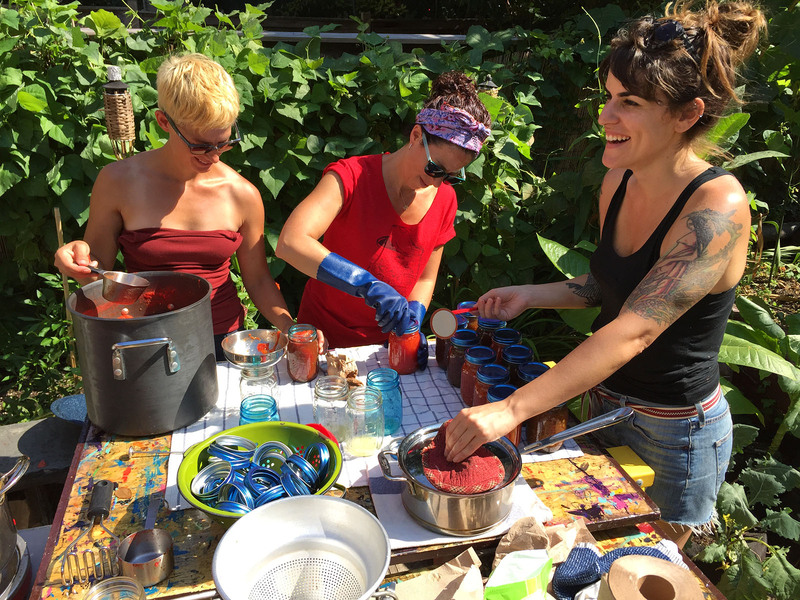 Our second annual Canning Day was also a nice success. 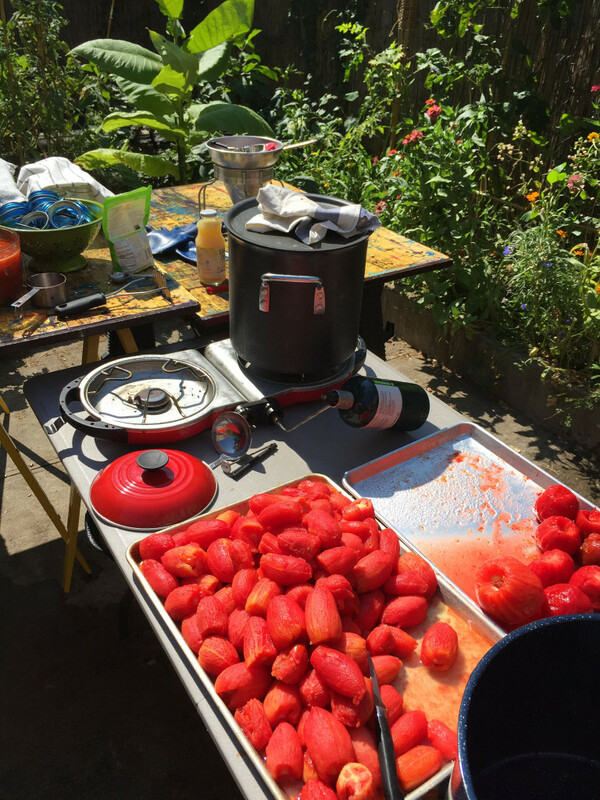 80 pounds of ripe tomatoes came from the farmer’s markets, along with more than a few industrial-strength burners, pots, steamers and strainers. We kept it to a core group of about five, as this is more of a marathon session than a party, and once it’s all set up, there ain’t much room to move around. A nice hot sunny afternoon. I’m no expert in this process so I run errands and try to learn what I can. 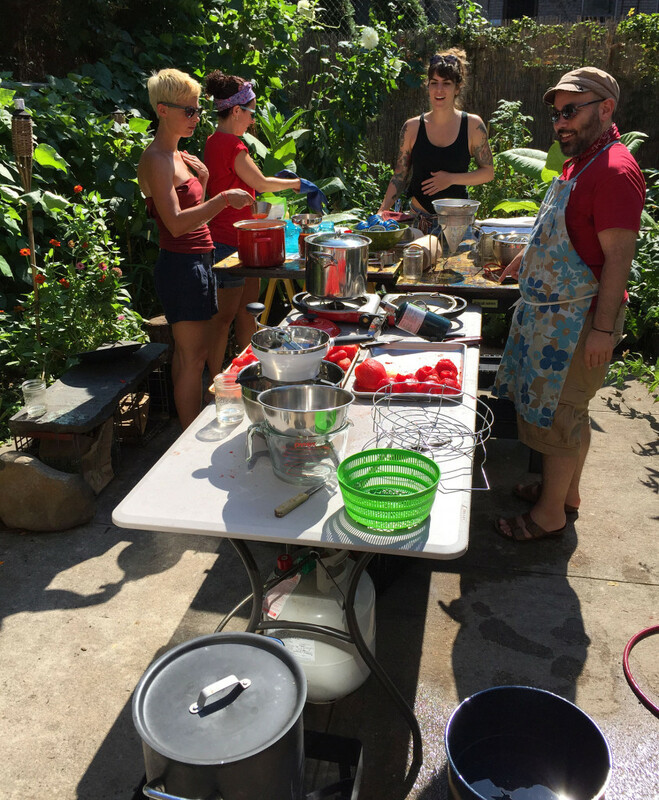 Canning Day, early September. Manning the canning stations. The experts at work. Everybody has a job! Our processed tomatoes, ready for the winter pantry. 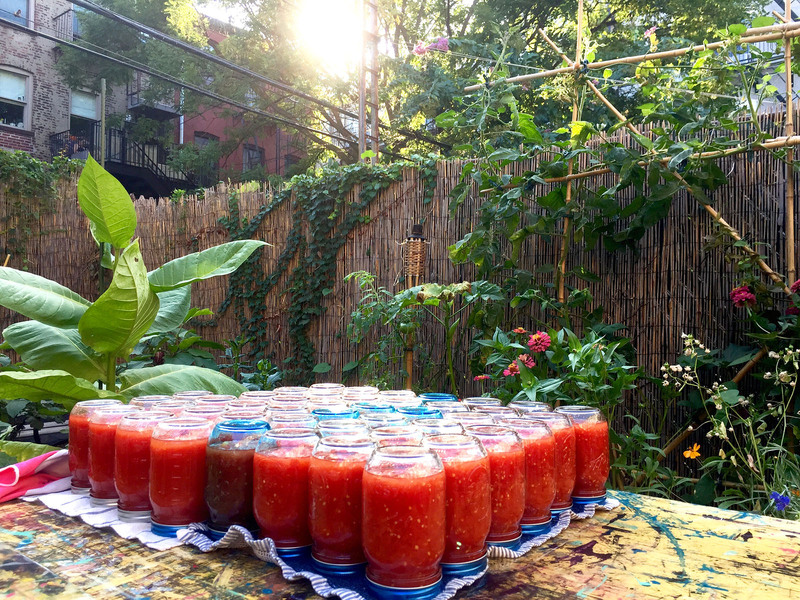 We each got about a half dozen of these or so… all told 80 lbs of tomatoes yielded about 50 pint jars. 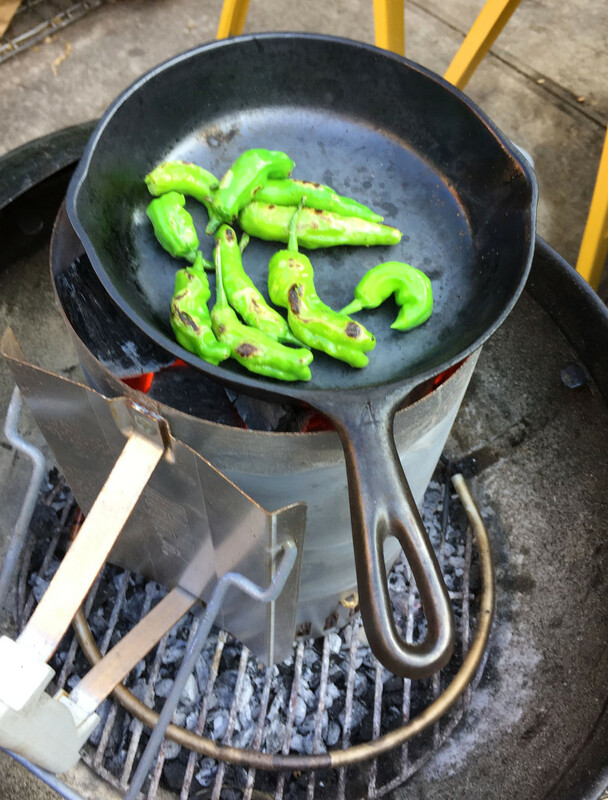 I found a double use for the BBQ charcoal chimney– frying up some Shishitos right off the vine while the coals heat up. 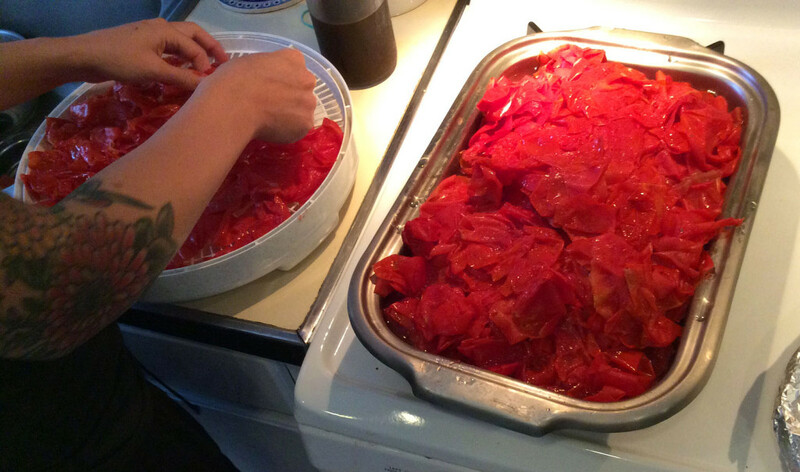 We also salvaged the many pounds of tomato skins. My canning buddy took charge of drying them and converting them into flakes for sauce bases and also as flavored tomato salt.